TruStile’s 3D Models expand your ability to design in the right door, with the right details and the right features, at a click of a button. We’ve applied Revit, ArchiCAD and SketchUp best practices in developing dynamic models that are both accurate to our product rules and flexible with the design details you need. From adding glass to our panel doors to adjusting stiles and rails you can customize a TruStile Door to meet your design vision. What’s more, we’ve curated door styles across all major architectural styles, from modern to traditional, providing 3D models that will make your next 3D render and overall project more precise. 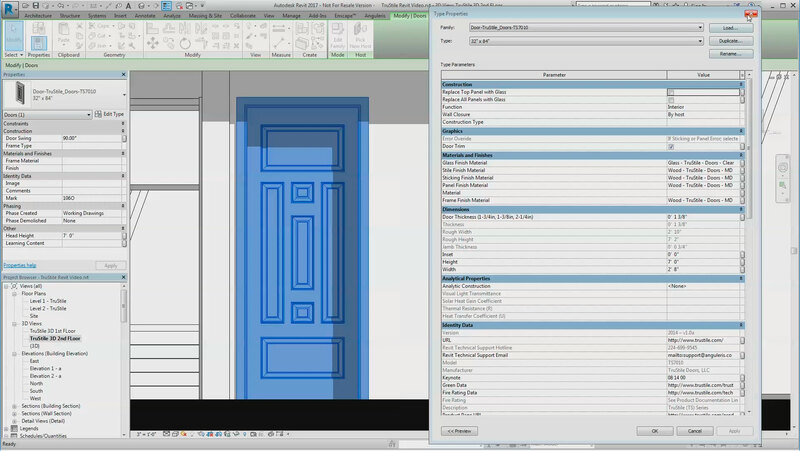 To download a 3D model for an individual door style, click the button labeled with your preferred 3D application. You can also download all available models, grouped by associated application, as a Zip file or ArchiCAD library file: Revit Models (228.5MB), ArchiCAD models (6.5MB), SketchUp (15.81MB). Static 2D DXF files of almost all our door styles can be generated by our TruCAD® Door Design Tool. Browse to the TruCAD®Door Design tool, customize a door style to your liking and select Export DXF from the toolbar.